Gold Leaf operates a number of Chinese restaurants in and around Melbourne. The one closest to home, and a new family favourite, is the Gold Leaf in Sunshine. 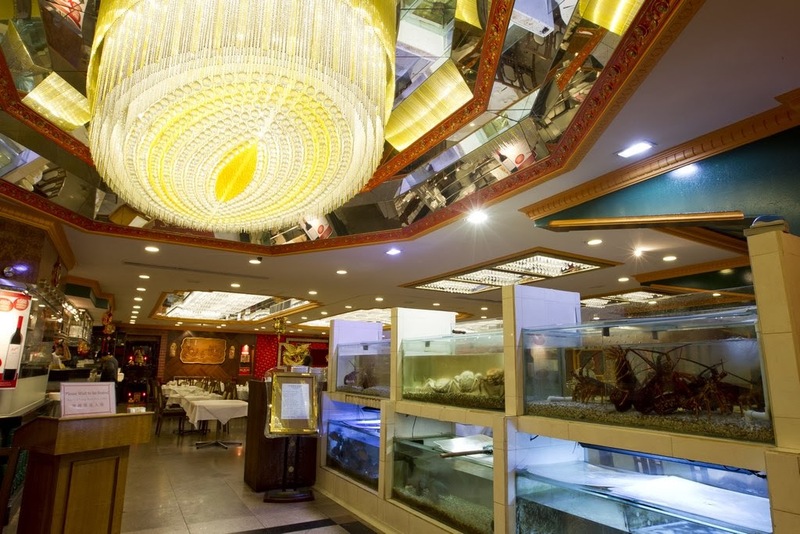 When we first entered the restaurant I felt as though I was somewhere in Asia on holiday – the Chinese newspapers in the entrance were fluttered by the wind as the poor little crustaceans sitting in water tanks soon became secondary to the grand display of gold and glass chandeliers. The ambiance at Gold Leaf is definitely authentic and it is the image of Chinese restaurants that I grew up with – that noisy, over the top but tired glamour, glitzy golden surrounding and the difficult to understand rude-in-a-funny-way Chinese waiter (though, admittedly, as a child I was more interested in crawling under tables than eating my san choi bow). If you want to experience the increasingly rare authentic Chinese that survives the flood of “modern” Asian on the market, visit Gold Leaf. The ambiance may seem a little tired, over the top and “fake”, but that is the unique personality of some suburban Chinese restaurants in Melbourne. It is what I enjoy about them, because it makes them different to fine dining establishments. The noise is loud, though, because the restaurant itself is in a very large space. 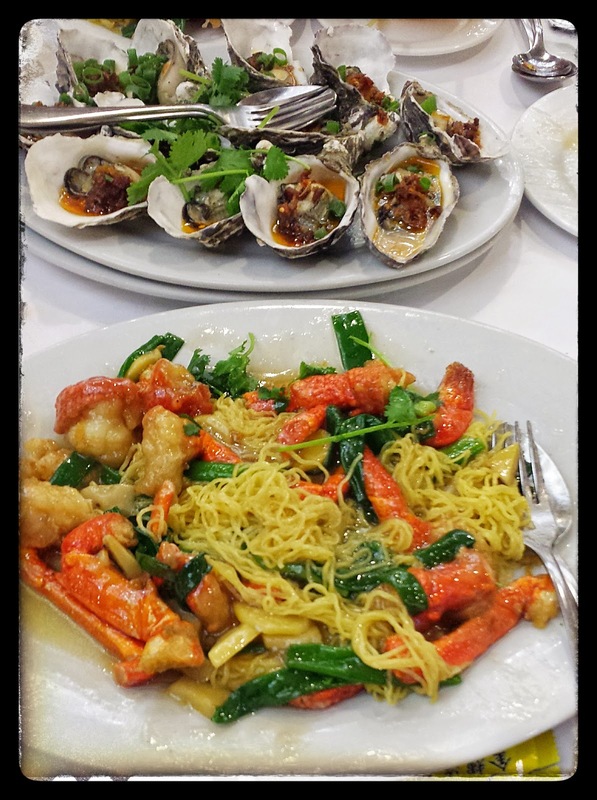 We ordered a few of my favourite Chinese foods – dozens of oysters with XO sauce and traditional lobster made with ginger and shallots. The oysters were faultless, and the lobster was nicely cooked albeit too heavily marinated with corn flour which coated the shell a bit too much. Another dish, wasabi prawns, included very large king prawns deep fried and slathered in sweet chili sauce and wasabi mayonaise. It is fatty, heavy and heart attack material… but my Dad loves it. A habit of ours is to always ask the waiter that our food be cooked with less oil, because on previous visits the food has been far too greasy. If we ask them to reduce the oil in the cooking, however, we find that it is lovely. I enjoy the authentic suburban Chinese restaurant personality of Gold Leaf – tired but glitzy in an almost tacky kind of way. I feel at home, comfortable and with the excellent quality of food I see no issues. It is the personality which I grew up with, and in a way I enjoy trying to speak over the loud Chinese family on the next table as I tuck into my delicious food. Now, time to fish out a copy of Dragon’s Forever which I probably watched a billion times!